In client/server computing a server is a large, powerful central computer. Servers are shared by many users who access it through remote input/output devices (keyboard/monitor combinations) that allowed the user to work with the remote computer. These are called terminals. Originally such terminals were hardware devices. With modern end-user PCs becoming more powerful in the 1980's, these dedicated hardware devices were replaced by software that runs on a PC and which simulates features of the original hardware terminals. Such programs is called a terminal-emulator (a software that emulates/simulates a terminal). In the early days of computing when processors and memory were extremely expensive, companies would often purchase one large, powerful central computer. Such a computer was shared by many users, who accessed it through so-called dumb terminals (sometimes they are also called thin clients or simply terminals). These terminals enabled the users to enter and view data, whereas the actual processing was done by the central computer. The terminals (thin clients) were devices which consisted of a screen, a keyboard, and the technology that allowed them to transmit keystrokes to and receive output from the server, but had no noteworthy computing power of their own. With the success of Linux, the client/server concept and central computing has undergone something of a renaissance. As a direct result of this the necessity of using a terminal to access a computer located in a remote location (be it somewhere across the globe or server vault in the basement of the same building) is yet again receiving a lot of attention again. Instead of using dedicated hardware terminals, today a terminal emulation software running on a modern computer provides the user with the means to access these servers. As noted above, a terminal initially was a combination of keyboard and a screen which were connected to a remote computer through a network, modem or network. However, to allow the server programs some flexibility, the terminals had some limited computing power that enabled them to perform tasks beyond merely printing all received text. Instead, they could receive specific codes which were embedded in the text, and use these to format the output of the text, rather than just printing text left-to-right and top-to-bottom like a teletype. However, each manufacturer (e.g. IBM, Digital Equipment, Wyse Corp.) used different codes to perform the formatting of text, so the terminals to access a certain type of server needed to be bought from the manufacturer of the server. In other words, different manufacturers used different codes that the servers sent to the terminals in order to move the cursor, change the color, clear the screen and so on. Among the best-known terminal manufacturers were DEC (who created the line very popular of VT-Terminals, including vt100, vt220 etc.) and IBM (using 3270 and 5250 terminals). There were also attempts to standardize codings for these tasks, the so-called ANSI terminals. For example, on a VT220 or ANSI terminal, to send the text "this is an error!" to the user's screen with the word "error" in red, the host would actually send This is an ^[31m error ^[0m! to the terminal emulator. Rather than displaying all the text, the VT220 terminal will strip the cryptic code parts ^[1m and ^[0m as commands and will print the text between them in a different color. As processors and memory gradually became more affordable, the idea of a Personal Computer was born. This novel concept meant that each user would be able to access their own memory, and that their personal processor would be sitting right there on their desk. As the use of computers has increased, data processing has once again become very demanding. Nowadays, it is not uncommon to need to access gigabytes of data in databases or to process extreme amounts of information. Because of this, the idea of server computing has been resurrected. Personal computers with memory and processors are still used for simple computing tasks such as word processing, but for more complex work users may need to access remote systems. Instead, software now plays the role of a dumb terminal. This software is called a terminal emulator, as it emulates a dumb terminal or thin client on a PC. In short, a terminal emulator is a program that does what a dumb terminal used to do in the early days of computing. It transmits keystrokes to the remote server, receives output from the server, and displays it in a window which simulates the screen that was used in the past. However, the real benefit of using a terminal emulator is that it really isn't as 'dumb' as a real terminal. Instead, it offers functions such as logging output to a printer, saving output to disk, allowing input and output to be sent/received and processed automatically. A terminal emulator can also help you automate repetitive tasks. As noted above, many manufacturers used to develop their own terminals with their own type of ommunication between the server and the terminal. The good thing about modern terminal emulators is (compared to hardware terminals) that they can understand most of the codes that were used in the past. A single terminal emulation program like ZOC can actually play the role of both an IBM and a DEC terminal, depending on which server a user needs to access (e.g. an IBM mainframe or a Unix server). Nowadays, terminal emulators are used for a wide variety of different tasks. They are used by Unix and Linux administrators to access their web servers, by employees of companies who need to access different types of software on central computers, by doctors to retrieve blood test results from central lab computers, and so on. The ZOC Terminal Emulator is a professional terminal emulator because it supports the standards of several manufacturers (vt100, vt220, TN3270, Ansi, Linux/Xterm, Wyse, to name just a few), and allows users to access virtually any server that requires the use of a terminal or terminal emulator (via connection as ssh client, telnet, modem, etc). 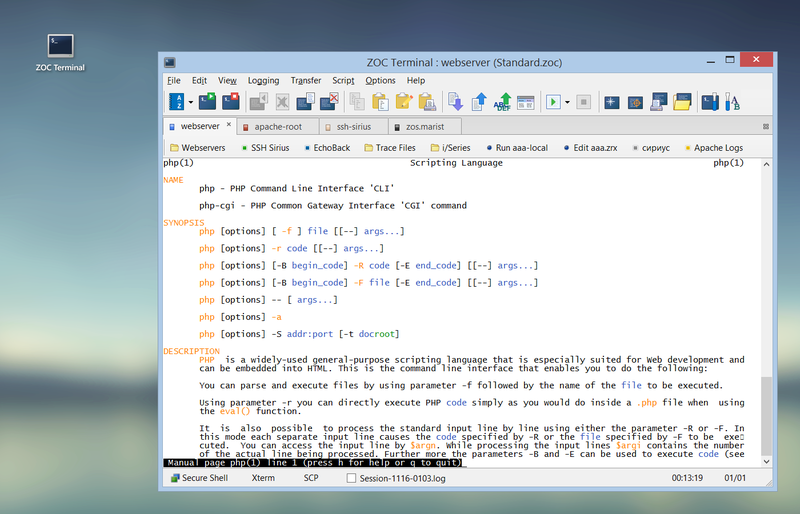 As well as the basic terminal functions, ZOC offers a wealth of additional, useful features. This terminal emulator takes advantage of the computing power of a PC to allow you to automate tasks (such as logging on or retrieving data automatically), log sessions on screen or file (for documentation or later review), copy data between a text processor and the remote server, and much more. Find out more about our ZOC Terminal Emulator, check its feature list, look at our screenshots or start your free 30 days of evaluation today and download ZOC Terminal V7.23.3 now.